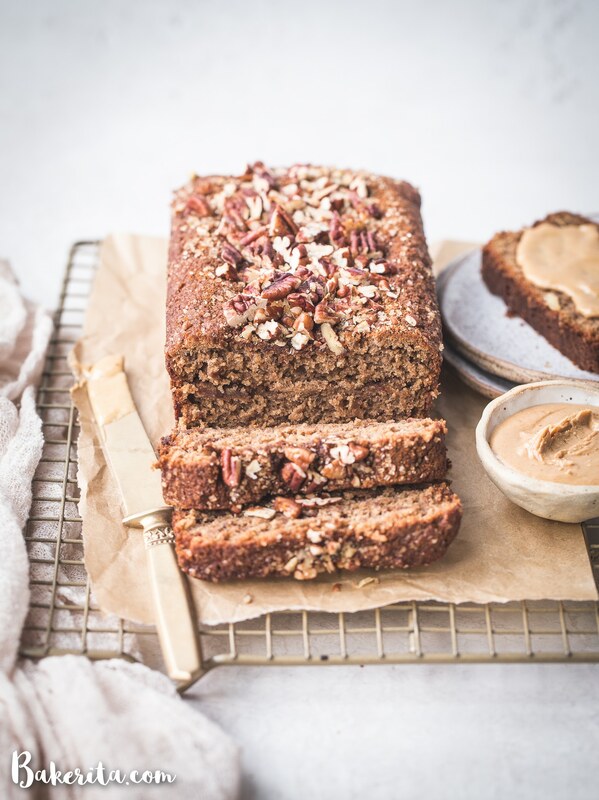 A slice of this gluten-free and vegan Cinnamon Swirl Banana Bread makes the perfect easy breakfast, snack, or even dessert! This soft and sweet loaf is especially delicious when slathered with some vegan butter or nut butter. The first night that I tested this Cinnamon Swirl Banana Bread, it came out of the oven around 10:30 pm. By the time I went to bed, about 1/4 of the loaf was gone  whoops! Usually, I let loaves cool overnight before cutting into them, but with the scent of cinnamon, sugar, and sweet ripe bananas permeating my apartment, I couldn’t resist cutting into the warm, cinnamony loaf. I mentioned in my last post that I just finished writing my first cookbook, and while I thought I would want to take a little time to decompress and take a break from baking/writing/photographing, the opposite was true. As soon as I turned in my manuscript, I itched to get back into the kitchen to make new recipes that I could share with you now. I’ve missed sharing the creations I’ve come up with as soon as they come out of the oven, and it fills me with joy to be able to share new recipes with you again. 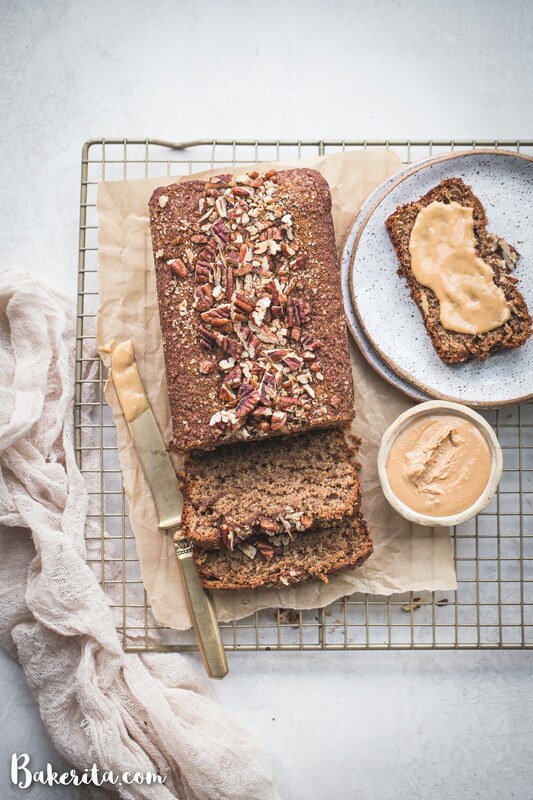 This Cinnamon Swirl Banana Bread was one of the first recipes I finished post-cookbook, and it brings me so much joy to be bringing it to you now. This recipe is one of my new favorites, as most things with cinnamon tend to be. 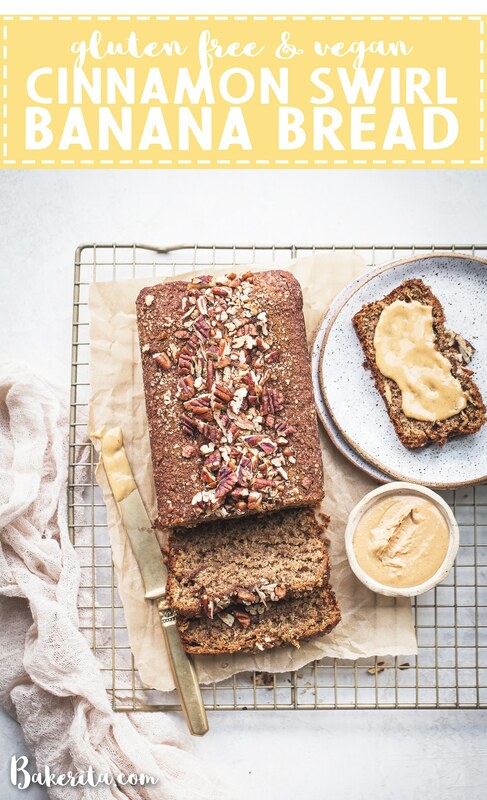 The banana bread itself is made with a full cup of mashed ripe bananas, which helps keep the texture super soft and tender, and of course, full of banana flavor. I used cashew butter to help with moisture and tenderness as well, but you can use any nut butter you like – I find cashew butter just has the most buttery flavor, which works so well here. A combination of almond flour and gluten-free oat flour make for a texture that’s not too dense or gummy, and of course, a hearty dose of cinnamon is mixed into the batter to add a delicious warm flavor. The banana bread batter is layered with cinnamon sugar, which after being baked, creates ripples of cinnamon sugar goodness in every bite. And the cinnamon sugar pecan topping! 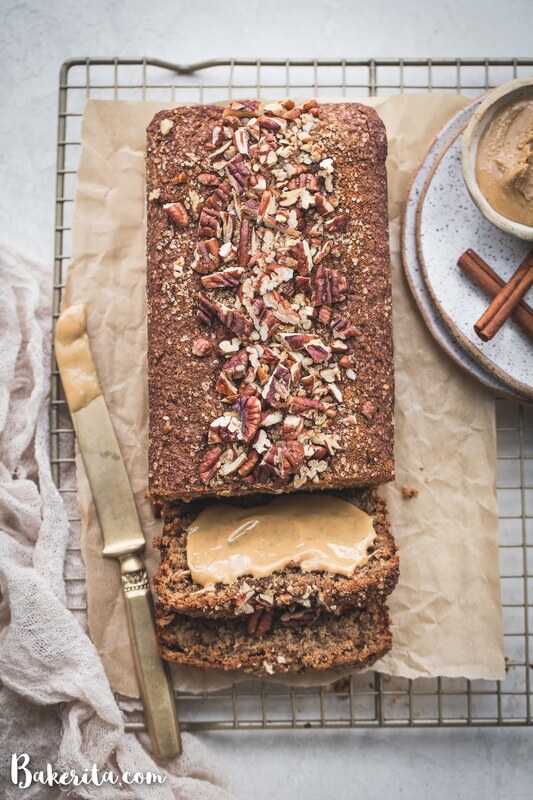 For the topping, we used more of the cinnamon sugar mixture, and then top with pecans for crunch (though any nut could be used here) and raw turbinado sugar, which adds texture, sweetness, and a beautiful shimmer to the top of the loaf. The topping takes the loaf from great to outstanding, so I wouldn’t skip it. 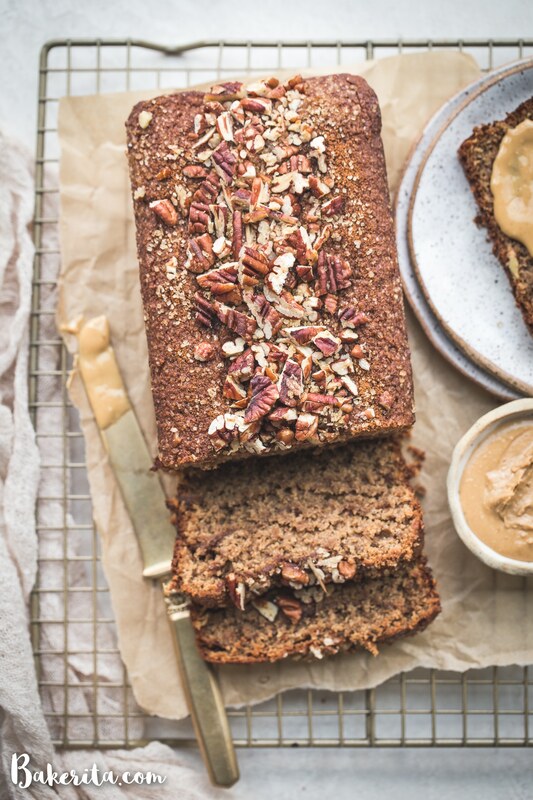 Slices of this cinnamon sugar banana bread are more than good on their own, but even more delicious and filling when slathered with a little bit of nut butter. I loved it with both cashew butter and peanut butter. This Cinnamon Sugar Banana Bread got rave reviews from everyone I shared it with (which was a lot of people, because I needed to get it out of my house so I didn’t eat it all myself). I hope you’ll love it just as much as we all did! :) Enjoy, my friends! Preheat oven to 350ºF. Grease a 8.5” x 4.5" loaf pan (you can also use a 9x5” pan for a thinner loaf) with coconut oil and/or line with parchment paper. Place bananas in a large mixing bowl. Use a potato masher or fork to mash them well. Add almond milk, coconut sugar, nut butter, coconut oil, flax meal, and vanilla extract, stirring to combine. Add oat flour, almond flour, baking soda, baking powder, salt, and cinnamon. Stir until combined. Pour a third of the batter into the loaf pan. Sprinkle ⅓ of the cinnamon sugar mixture evenly over the top. Spread ½ of the remaining batter over the top as evenly as possible. Top with ½ of the remaining cinnamon sugar, and then top with the rest of the batter and the rest of the cinnamon sugar. Garnish with pecans and turbinado sugar, if desired. Bake for 50 minutes to an hour, or until a knife comes out clean and the loaf springs back when pressed with a fingertip. If your loaf looks like it's getting too brown, tent with tin foil on top after 45 minutes. If you’re using a 9x5” pan, check on the banana bread after 40 to 45 minutes. Once done, let cool in the pan for 15 minutes and then remove from pan and place on a wire rack to cool completely before slicing. Store leftovers tightly wrapped in plastic wrap, foil, or in a sealed container on the counter for up to three days, or store in the refrigerator for up to a week, or in the freezer for up to 6 months. I like to slice it and then freeze and heat a piece in the microwave when I want it! Sounds delicious! I have problems with flax meal; is there anything that could be used instead of it? Ground chia seeds should work instead! Hi, what’s the nutritional info for this? You can calculate on myfitnesspal.com! Hi! 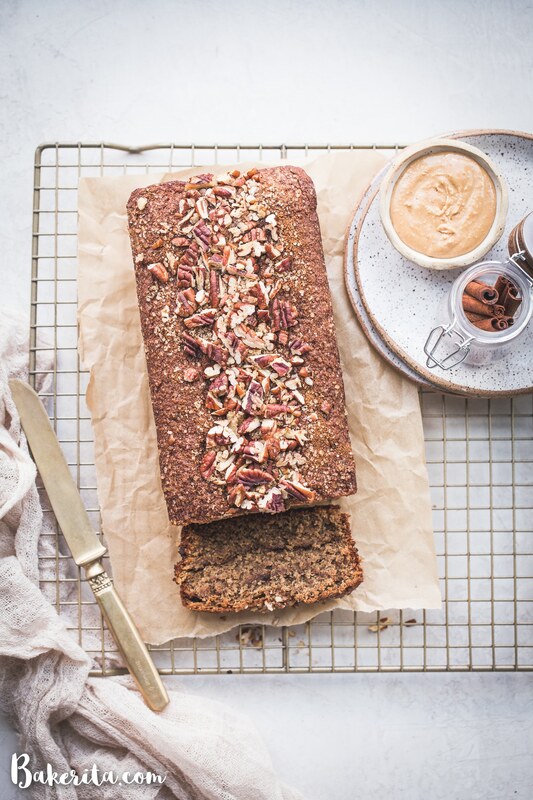 I follow the Paleo diet for health reasons, and would love to make this, but can’t do oat flour. Could I omit that and double the almond flour? Or do you have another suggestion that would work better?